Hostal Victoriano, Madryt, Hiszpania : Rezerwuj teraz! Our guesthouse is an ancient and elegant building, but we have free WiFi for your best comfort and air conditioning in all the rooms. Our friendly staff will be delighted to help you at any time because we are open 24 hours! We also provide you laundry facilities and hairdryers in case you need it! Hostal Victoriano is surrounded by many cafes with outdoor terraces, lively bars for stepping out at night and tasty tapas bars and restaurants where you can try the local flavours. There are excellent public transport links, but you can also get everywewre on foot, the Puerta del Sol is just 15 minutes walk away. 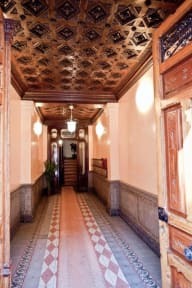 All the rooms are decorated with parquet flooring and patterned purple wallpaper. The rooms are chic, modern, and very bright. We provide you a full equipped private bathroom with hot showers. In all the rooms you will find air conditioning and heating. Rooms include a wadrobe to make your stay as simple as possible. Check in from 13:00 PM to 00:00 AM. Please, let us know your arrival time.